If you have memory problems, you might not be using your brain in the right way. The solution? 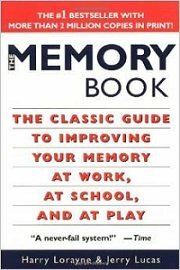 Learn the best memory trick used by professional memory performers. Visualization is a muscle. It can be grown and strengthened, stretched and flexed. The reality is that we can teach our brains how to see more clearly and then we can teach them how to show. This method takes advantage of an amazing fact about human memory: most people remember images better than verbal or written information. For example, I can easily see in my mind's eye the homes that I have lived in during my life (including the interior rooms), even though I might not be able to remember all the addresses and phone numbers. Images are concrete, while raw information is often abstract. With the V&A technique, you convert the abstract information into easy-to-remember mental pictures. These images are literally mental hooks that allow you to retrieve the information from your long-term memory. Before I explain how to do the V&A memory technique, let me explain why it works. I have already mentioned that images are easier to remember. But it goes beyond that. Other important aspects of memory that V&A takes advantage of are concentration and repetition. If you can't focus, you won't remember what you are trying to learn. The V&A process forces you to focus. Why? Because you are actively using the material. To change facts into mental images, you must focus; you have no choice. In addition, exposing yourself to the material over and over while creating images provides repetition, or reinforcement. When creating your mental images, you naturally repeat the details until you get each image clear in your mind. By the way, V&A is not time consuming; instead, it saves time. Creating mental images does take a few moments. But if you practice a little each day, you will get very fast. TIP: If you have trouble seeing images in your mind's eye, try sketching the images on paper. This is known as memory cartooning. Think about this: how much time have you wasted repeating something over and over in the hope of remembering it, and then you forget it anyway? Use the V&A memory trick, and you will remember the information very well the first time. And it will stick. Let's use visualization & association to memorize the shape of stratovolcanoes, so we can both easily recognize them and remember what they are called. There are three types of volcanoes: shield volcanoes, stratovolcanoes, and cinder cones. Shield volcanoes are wide and flat, with slow moving lava. Stratovolcanoes are high and pointed mountains that explode violently during eruptions. Cinder cones are small, form quickly, and are composed primarily of light cinders and ash. For this example, we want to remember about stratovolcanoes in particular. Good examples of stratovolcanoes are Mt. 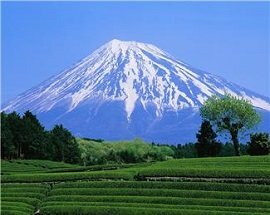 Fuji in Japan or Mt. Ranier in North America. 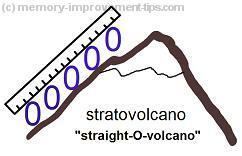 But how can we easily memorize that "stratovolcano" is what they are called? The trick is to convert the sound of the word "stratovolcano" to a mental image, then connect that mental image with a mental image of Mt. Fuji, Mt. Ranier, or another similar volcanic mountain of that shape, or even just a drawing of that shape. To me, the prefix "strato" sounds a bit like "straight oh" (like the letter O). It's not necessary to match the entire sound of the word exactly. Remember, we are just hoping to create a mental hook that we can use to retrieve the fact from memory later. Basically, we're creating an artificial reminder that will jog our memory later. "Straight O" can be represented various ways depending on your imagination. Straight reminds me of a ruler, and the letter O could be a gigantic series of letter O's marching up the mountain. Simply put, I now envision a steep mountain with giant O's lined up very straight going up the side. To the right is a drawing that represents "stratovolcano" ("straight-o-volcano") as I'm picturing it in my mind. You can see that the image doesn't need to be complicated. But it does need to be clear about what is being represented. The more clearly you can visualize the image, the better the image will act as a "hook" for you to retrieve the information from memory. That's it! The next time I want to remember what those tall, mountainous volcanoes are called, my mind will immediately recall this image of a ruler above giant O's that are going straight up the side of Mt. Ranier or Mt. Fuji. I'll think, "Lined up O's... straight O's... ah, yes - strato... stratovolcano." TIP: The larger, more incredible, sillier, or more outrageous you make the images, the better they will work as mental hooks. Your mind remembers the unusual far better than the ordinary. You can also use the sound-like method for regular concrete nouns. For instance, suppose you want to remember to purchase blueberries at the grocery store. Blue bear works as a memory hook for "blueberries"
You could use the Rhyming Peg system to memorize your grocery list. For the blueberries specifically, you might want to imagine a "blue bear" instead of the berries themselves. You see, blueberries alone may not be very memorable to you. But imagine yourself riding a blue bear - now that, you won't forget! 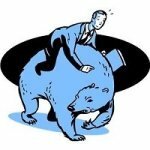 The sound of "blue bear" is a mental label or tag that helps you retrieve from memory the real word you want to recall: blueberries. For more examples of this technique, see my Visualization & Association page. Some scientists believe we never forget anything. Nine times out of ten, the reason we can't remember is that we can't find the information in our brains. It's there, we just can't get to it. We have not made it a habit to create the mental hooks (the mental images) that we need to grab and pull out the information. That's what I meant at the beginning about not using your brain in the right way. If you practice the V&A memory technique, you will get very good at creating the mental hooks for anything that you want to remember. At first, it may seem like an artificial way to remember something. But remember, Visualization & Association is what the memory performers use, and it works. It's actually a lot of fun, once you get the hang of it. It really taps into your creativity.